Hello! 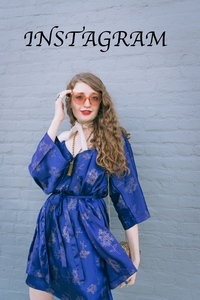 As I mentioned in my last post, there is a revival of 1970's fashion this season and I'm currently obsessing over it. Focusing on the 70's trend, I pulled this look together. Bell sleeves? Check. Flare pants? Check. 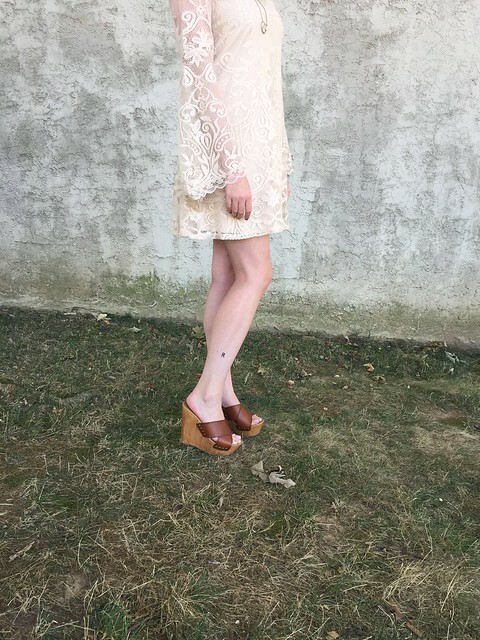 Platform sandals? Check. 1970's mustard color? Check. 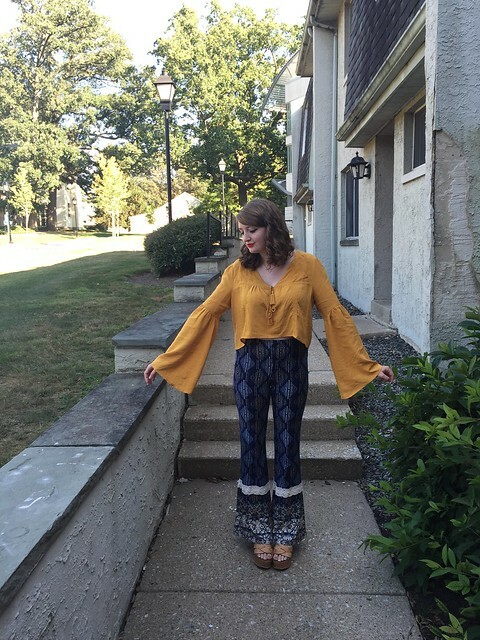 I recently purchased both this top and these pants from Forever 21 and am in love with both pieces. 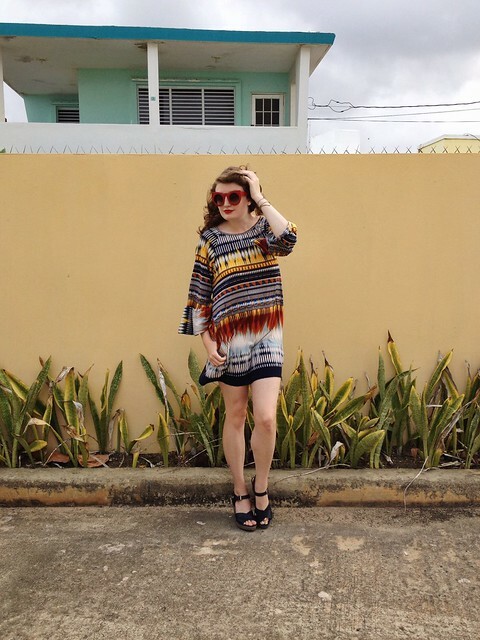 The bell sleeves, cropped fit and deep color of the top drew me to it immediately. I purchased it for about $20; it's currently on sale for only $14 here and if you're looking to add a dose of the 1970's to your wardrobe, I would definitely recommend you buy this top. 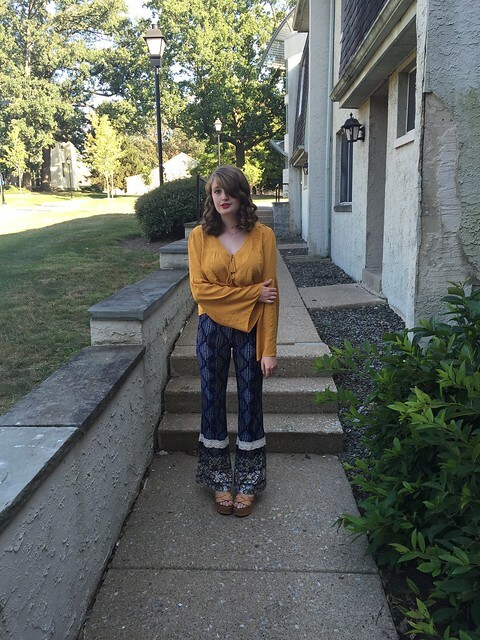 As for the pants, I fell in love with the bohemian print, crochet detailing and flare fit- also so 70's. They only cost $18 and are another purchase I would reccommend. $18 for a pair of pants that are so ultimately flattering yet comfortable is a steal. You can check them out HERE. Hello! 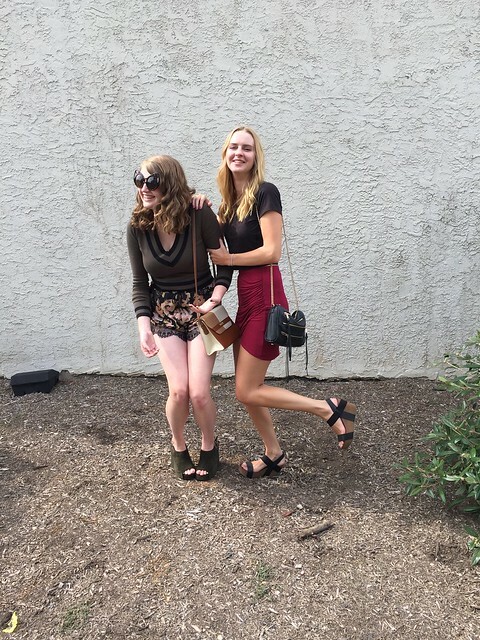 Yesterday, one of my roommates, Janelle, and I posed for a quick outfit photo. Like myself, Janelle is a third-year student at Philadelphia University. However, her major differs from mine; she is studying interior design. Her personal style is pulled together and has a little bit of a sophisticated preppy vibe to it. 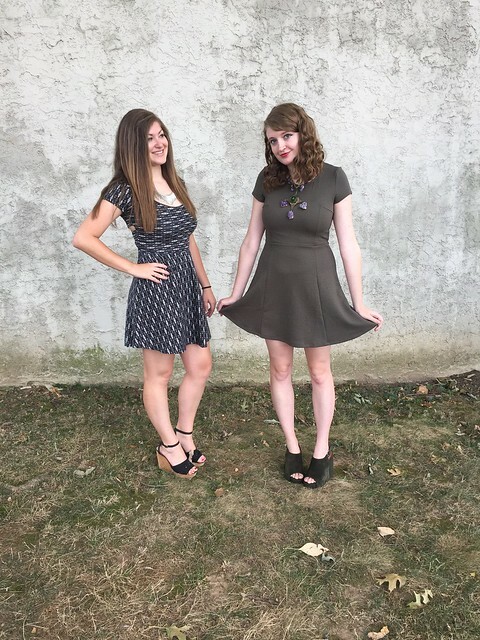 We both pulled out fit & flare dresses from our wardrobe; the flattering silhouette has captured both of our hearts. I styled my textured, olive green fit & flare dress with a pair of suede wedges, statement necklace and subtle lipstick. Janelle rocked her printed fit & flare dress with a pair of wedges and spiked statement necklace. Hello! 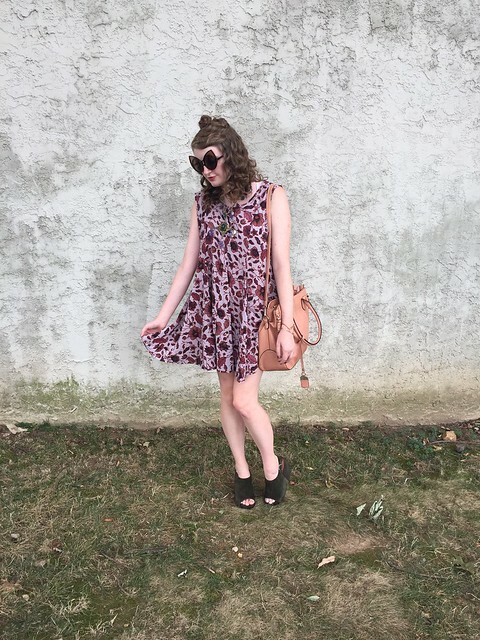 This is what I wore for my first day of classes of my last year at Philadelphia University. 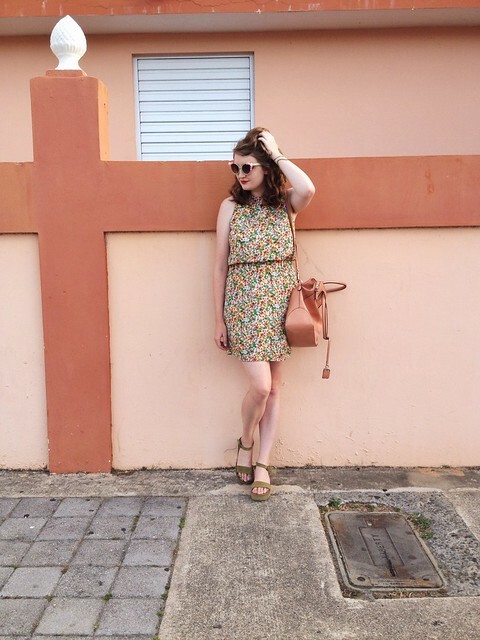 I pulled out a new dress from my wardrobe: a breezy floral dress blooming with rich colors. 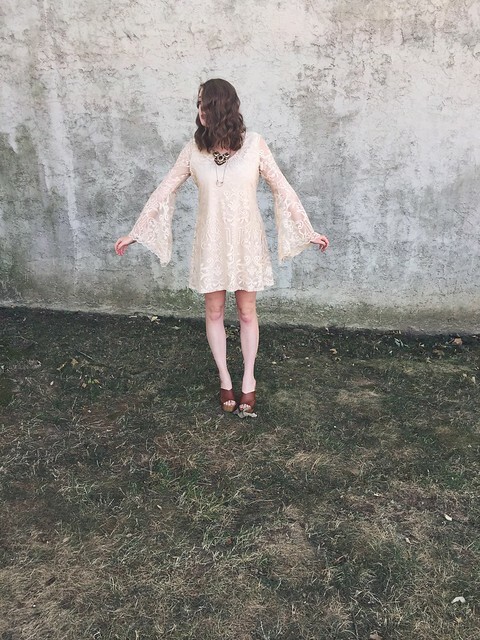 I purchased this dress a couple weeks ago and have already fallen in love with it. 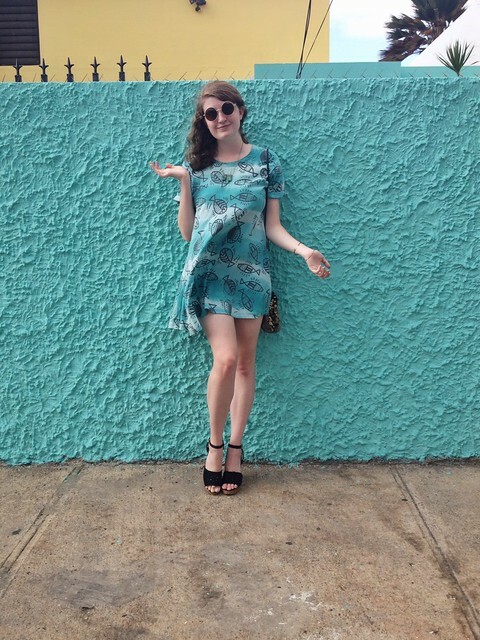 From the loose shape to bohemian floral print, there's nothing about this dress that I don't simply adore. I styled it with a pair of deep green Jeffrey Campbell wedges, a couple golden bracelets and a statement stone & crystal necklace. 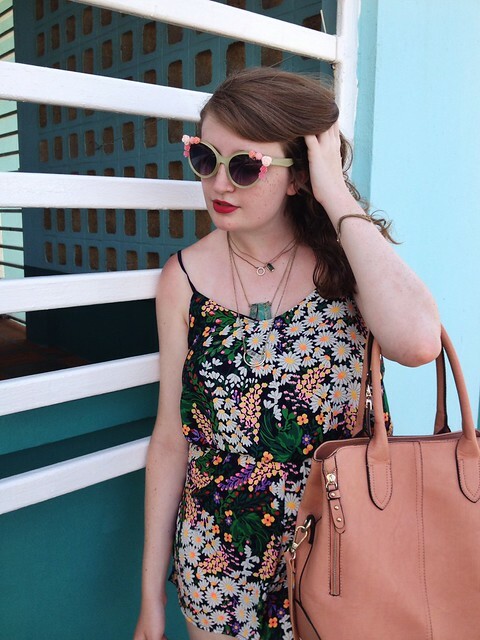 A peach tote bag, cat-eye sunglasses and sweet lipstick pulled the whole look together. Hello! Wow, did this summer fly by; it seems like only yesterday I was heading back to Richmond and now I've left Richmond once again. I accomplished a lot this summer from my online summer classes to my waitress job to interning with Kay Adams at Anthill Antiques with a couple vacations sprinkled in. My internship was definitely one of the highlights of my summer; I learned so much from Kay from visual merchandising to bead making to brand promotion to chandelier making. I also worked with her on starting her Instagram @anthillandkayjools; I would definitely recommend checking it out and taking a peek into the wonder that Kay's shop is comprised of. Or better yet, if you live in Richmond, stop by Anthill Antiques in Carytown and check it out for yourself! The internship opened me up to a lot of knowledge and experience that I did not have prior to this summer. I'm looking forward to taking that knowledge and paving a way for myself in the fashion industry with it. For this look, I decided to let the necklace shine and paired it with a black circle skirt and black top. I accentuated the shade of green in the necklace with a pair of olive green flatforms. 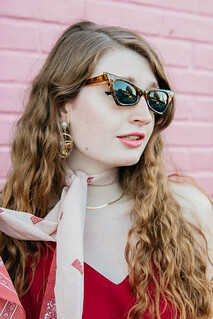 Glam cat-eye sunglasses and red lipstick pulled the whole look together. Good luck to everyone who starts classes tomorrow like I do! P.S. 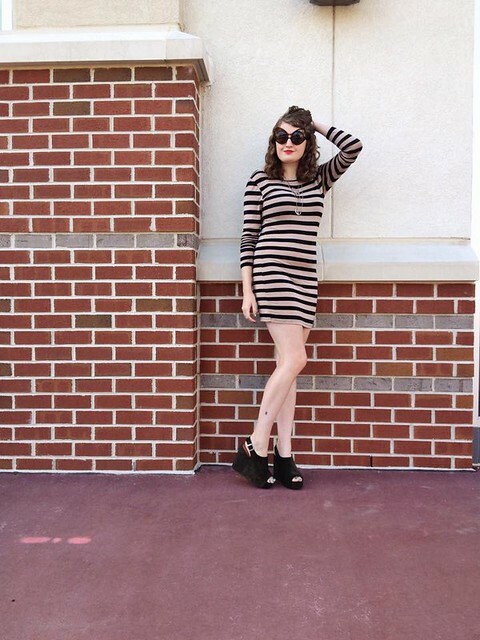 Remember to enter my giveaway to win a pair of glasses from Firmoo to update your wardrobe with this fall; ends 8/30! Hello! 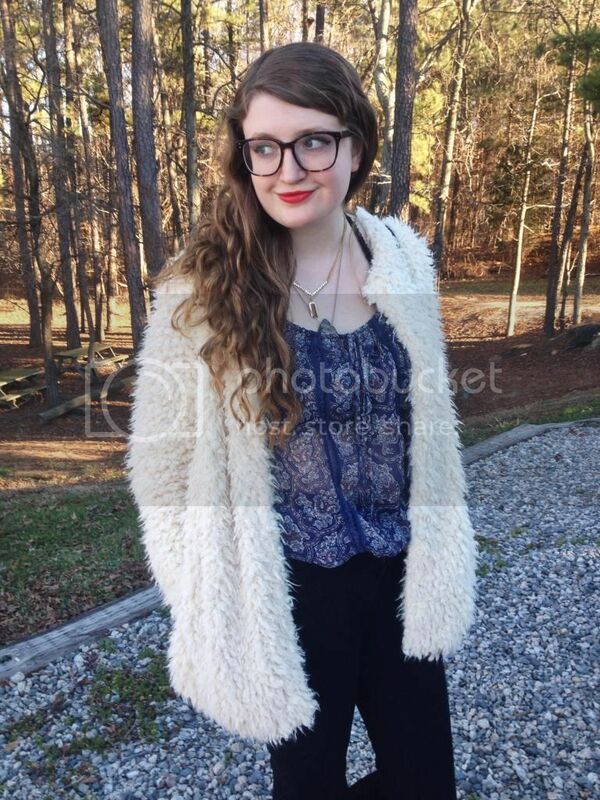 Last week, I celebrated my twentieth birthday and took a few snapshots of my look that day. 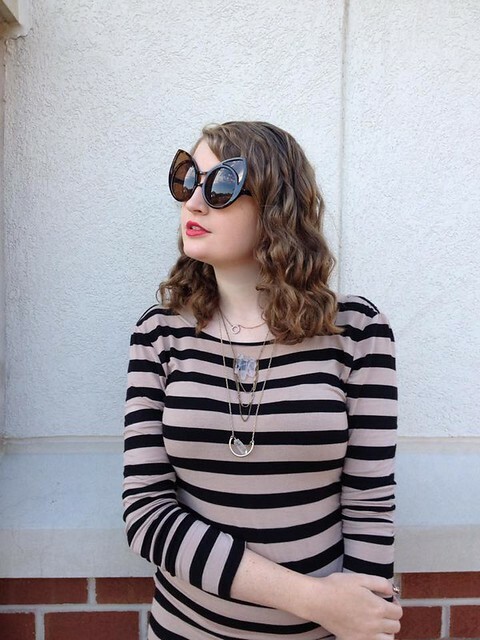 I slipped on a classic striped dress and paired it with neutral accessories like my crystal necklaces and tortoiseshell cat-eye sunglasses. A pop of red lipstick added a hint of vibrance to the look. I also took the day to debut my birthday gift to myself- a pair of Jeffrey Campbell wedges. These are the "Smug" wedges in khaki suede and they retail for $155. I've had my eye on these wedges for a while; I was instantly drawn to the versatile shade of deep green and suede texture. I couldn't resist them and purchased them as a gift for myself for my birthday. I'm looking forward to all the different ways that I'll be able to style them this fall. Hello! Today, I have a giveaway brought to you by one of my favorite brands, Firmoo. Firmo sells prescription and non-prescription glasses for an affordable price. They have plenty of different styles and frames so that everyone is able to find their perfect pair. Above, I'm wearing one of the pairs of glasses that Firmoo has sent me (you can check out the full post HERE). I love my Firmoo glasses to death and love them as an alternative to constantly wearing contacts. Are you also swooning over Firmoo's collection of glasses? Well, enter to win a pair! 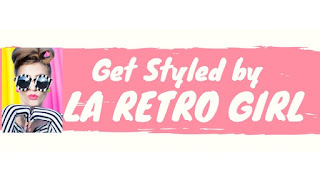 Today, I'm giving away one pair of glasses from their selection HERE to one lucky reader. To enter, all you have to do is follow my blog (in whatever way you choose), "like" Firmoo on Facebook, follow them on Twitter and leave a blog post comment with the glasses that you would choose. 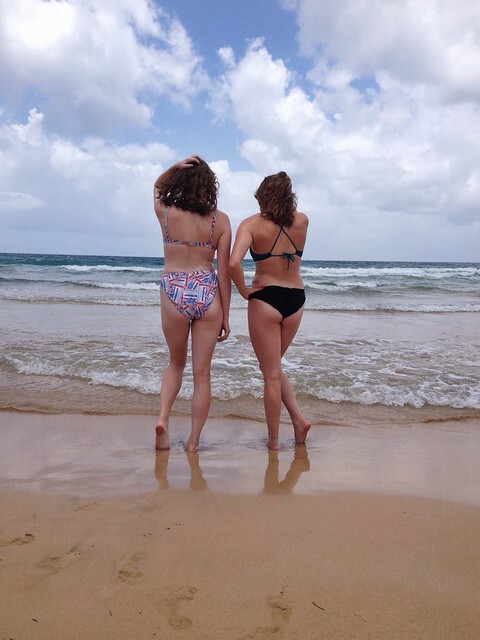 For an extra entry, you can follow me on Instagram @ToriRadday. The giveaway will run for roughly a week and a half until 8/30. Enter through the Rafflecopter app below. Hello! While snapping a few quick photos of this look, a neighborhood cat decided that he wanted to get in on the photos and posed with me for a couple. I couldn't resist sharing the best shot of the cat and myself above. Now, which is cuter- the cat or my outfit?? 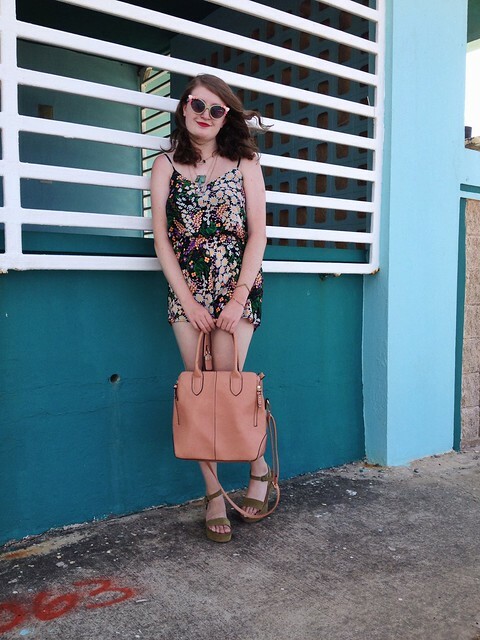 For this look, I pulled one of my new dresses out of my wardrobe. 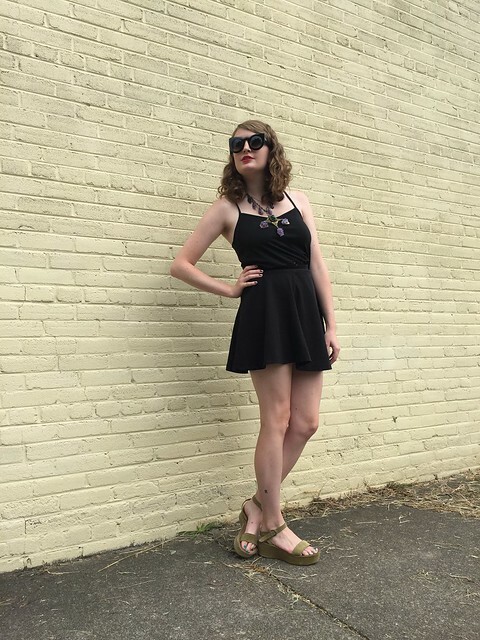 I purchased this little black dress online from Forever 21 for only $14.90 a couple weeks ago. The easy fit, dark color and bell sleeves have me swooning. If you're looking for your new perfect little black dress, I would highly suggest checking this one out HERE. 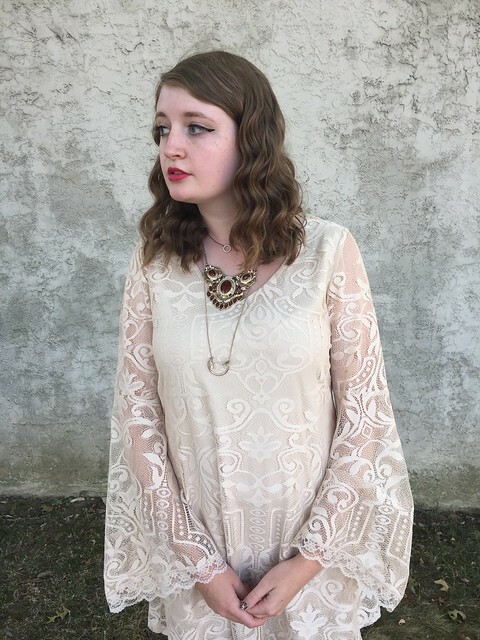 For this look, I went for a sort of 1970's witchy, boho aesthetic to accentuate the vintage-inspired bell sleeves of the dress. I layered on a couple golden crystal necklaces as well as a statement spiked ring. Red lipstick added a pop of color to the look. I also took the chance to show off a couple other new additions to my wardrobe. 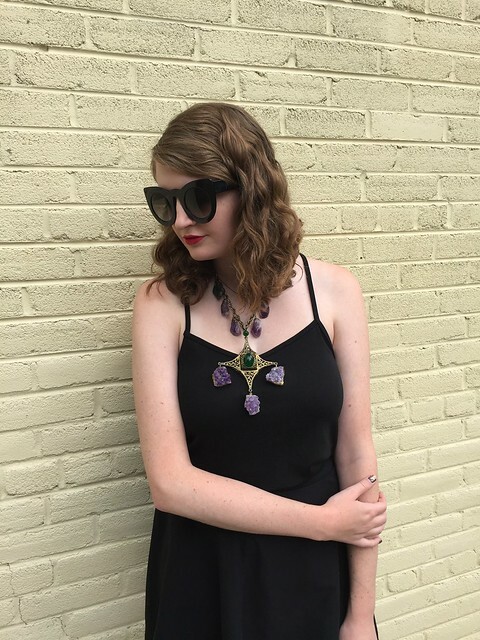 I recently picked up these feline sunglasses from Rumors, a quirky resale shop in Richmond, and immediately fell in love with them. 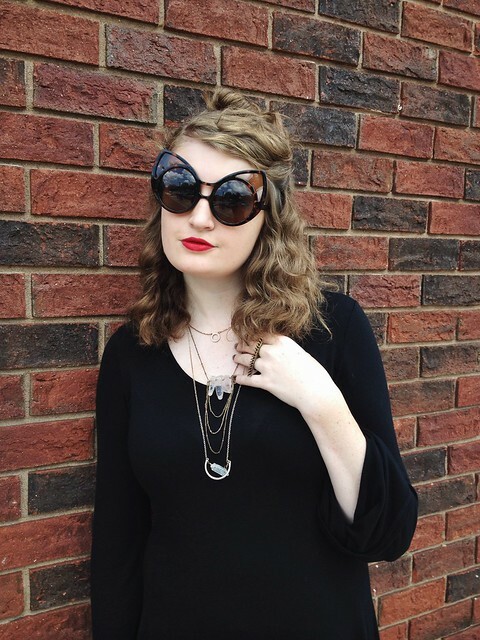 The classic tortoiseshell paired with the oversize cat-eye frame is just so glam. And they only cost $8! I also slipped on my new pair of black flatforms from Ashby; I purchased them for about $25 last week and adore their versatility.